Are you dreaming to own your very own vehicle, here is a solution Sampath Bank PLC announces that their special mobile leasing services would be available at Maharagama Urban Council Ground today 4th June 2016. 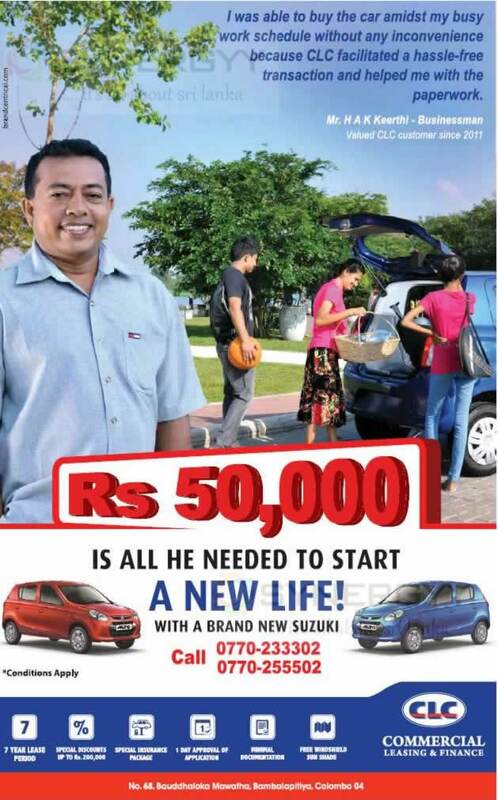 According to New Budget of Sri Lanka, leasing could be obtained only of 70% of the vehicle price, where 30% of the value should paid by cash. So if you looking forward a leasing option for brand new petrol, diesel, hybrid, registered and unregistered vehicle this would have been a best solution at a special leasing repayment of Rs. 1977/- per month for every 100,000/- lease. The Commercial Bank of Ceylon PLC has announced It is plans to extend their services to the Maldives following the receipt of regulatory approval. Commercial Bank of Ceylon PLC is a Sri Lanka’s largest private bank have obtained an approval from both the Maldives Monetary Authority and the Central Bank of Sri Lanka to set up a Commercial Bank of Ceylon PLC banking subsidiary in the Maldives. This would be name as Commercial Bank of Maldives Pvt Limited and Commercial Bank of Ceylon PLC will invest 55% of stake and balance will own by leading group of Maldivian companies. The bank start focusing into a new regional expansion after successful operation in Bangladesh, which entered in 2003, and Myanmar in June 2015. Commercial Bank of Ceylon PLC is enter to Maldives with single branch at male and increase their presence and increase upto 3 branches in near future and The Bank is to offer Mobile Units and ATM service at a strategic locations and the bank is willing to offer range of services like savings and current accounts, fixed deposits, personal loans, housing loans, credit cards, overdrafts, commercial loans, trade financing services, internet banking, mobile banking, remittances and foreign exchange. SANASA Development Bank offer special leasing facilities for Government employee, Retired Senior Citizens, Private Sector Employees and war heroes. If you belong to the exclusive group of citizens named above, you can drive away your own vehicle without a down payment and with one day leasing facility from any branch of the SANASA Development Bank island-wide. 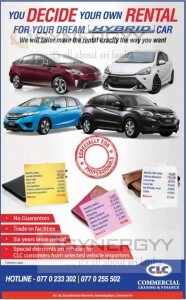 Contact our friendly and efficient staff today and take advantage of this exclusive offer. 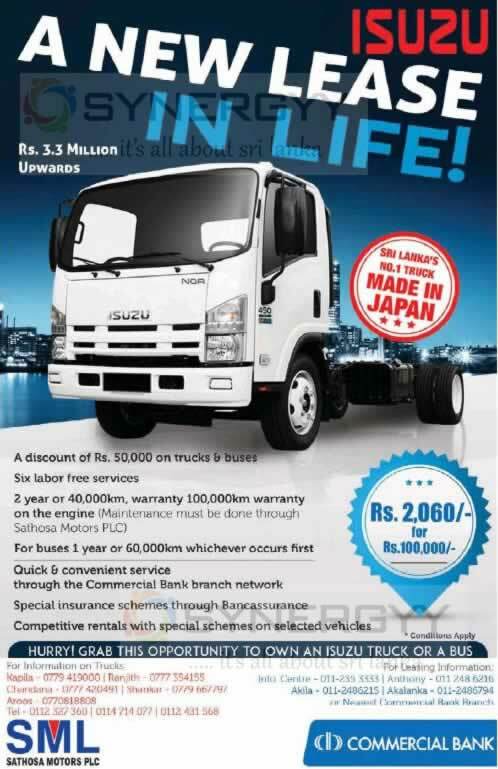 Sathosa Motors PLC announces a special Leasing Option for Isuzu Noa truck from Commercial Bank, and enjoys a leasing charge of Rs. 2,060/- per 100,000/- from Commercial Bank. Now is your good time to plan your second vehicle with Citizens Development Business Finance easy leasing options. Pay down payment of Rs. 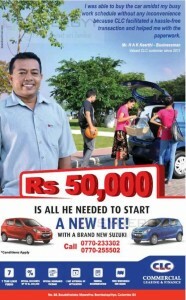 150,000.00 and drive your vehicles and pay your monthly installment from Rs. 19,999/- onwards. Planning a much needed vacation? 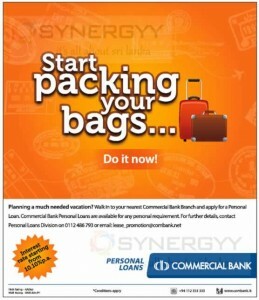 Walk in to your nearest Commercial Bank Branch and apply for a Personal Loan. Commercial Bank Personal Loans are available for any personal requirement. 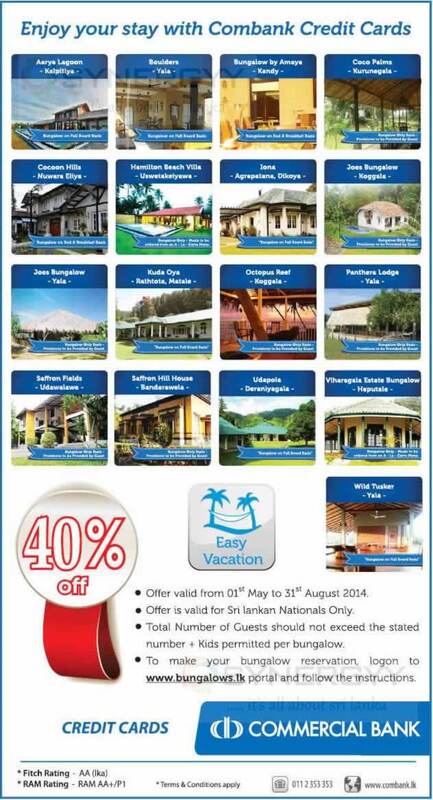 Commercial bank announces a special promotion of 40% of till 31st August 2014 at your bookings at www.bungalows.lk. The promotions are only valid for Commercial Bank Credit Card Holders from 1st May to 31st August 2014. Offer is valid for Srilankan Nationals Only. Total Number of Guests should not exceed the stated number 4 Kids permitted per bungalow. 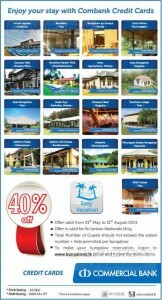 To make your bungalow reservation, logon to www.bungalows.lk portal and follow the instructions. The Commercial Bank of Ceylon PLC a leading leasing bank and leasing provider of nations offers its clear leasing scheme to public. For unregistered vehicles pay Rs. 2,202/- per Rs. 100,000/- with inclusive of VAT. For registered vehicles pay Rs. 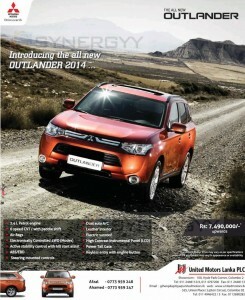 2,350/- per Rs. 100,000/- with inclusive of VAT. The lowest leasing rental for any vehicle now from Commercial Bank for more details visits to the nearest Commercial Bank branch for more details. 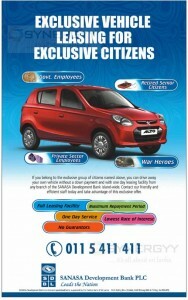 The Commercial Leasing and Finance cater your dreams of owning your own car of Suzuki Alto just for Rs. 50,000/-. Ride your brand new Suzuki Alto with option of 7 years Leasing period with special discounted rates and special insurance policies. and it is proceeds your applications in 1 day and handle all documentations too. It is your duty to visit Commercial Leasing and Finance and get advise how to obtain a leasing and submitting the relevant documents to ride your new Suzuki Car to your home. 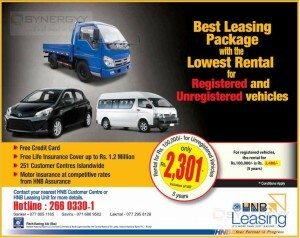 Best Leasing Package with the Lowest Rental for Registered and Unregistered vehicles. Pay less as Rs. 2,301.00 inclusive of VAT for every Rs. 100,000.00 lease rental for 5 years terms. Contact your nearest HNB Customer Centre or HNB Leasing Unit for more details. 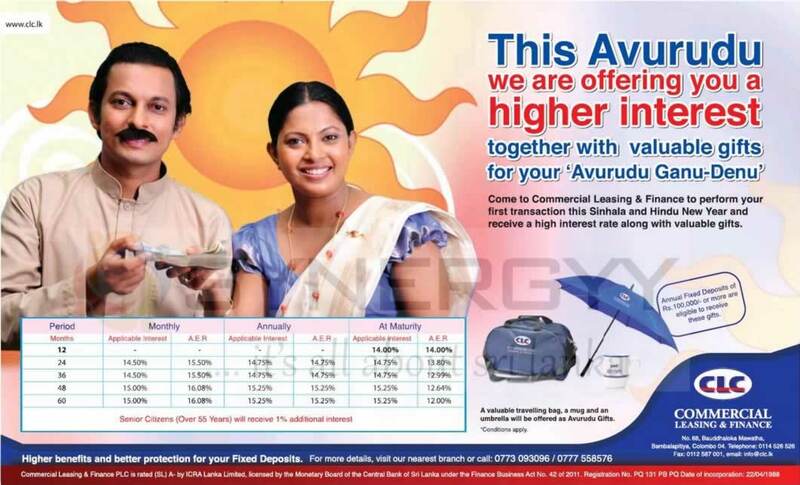 This Avurudu Commercial Leasing and Finance offers you a higher interest together with valuable gifts for your Avurudhu Ganu Denu. 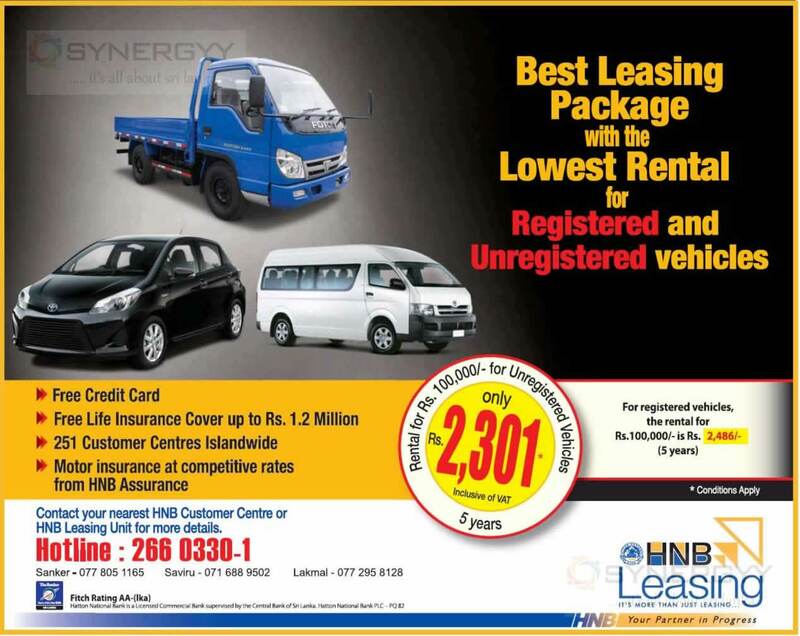 Come to Commercial Leasing and Finance to perform your first transaction this Sinhala and Hindu New Year and receive a high interest rate along with valuable gifts. Annual fixed deposits of Rs 100,000/= are more eligible to receive those gifts. The Lanka Orix Leasing Co., PLC announced to Colombo Stock Exchange that their Subsidiary company Commercial Leasing Company Limited Obtain the License for the Central Bank of Srilanka to operate as a Finance Company. The Announcement will help the LOLC to improve their businesses and the Long term Business Strategy in their Leasing Field.